Happy senior man and women with young girl waving on video chat with family near old amphitheater ruins in Ostia, Italy. 4k00:07Smiling young European girl and happy senior tourist group taking selfie near old amphitheater ruins in Ostia, Italy. 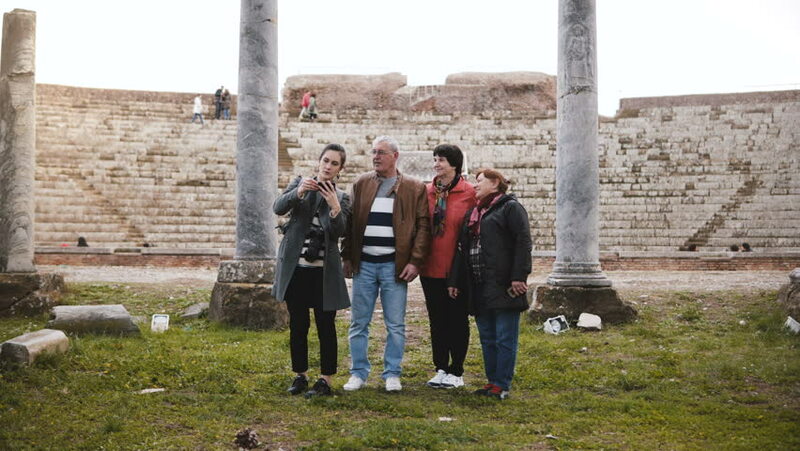 4k00:11Smiling senior family and young woman tourists waving on video call to family at old amphitheater ruins in Ostia, Italy. hd00:15Toronto, Ontario, Canada December 2013 Diverse people walking in snow wind cold weather. hd00:29CIRCA 2010s - U.S. troops walk through a village on patrol in Tantil Valley region of Konar Afghanistan. 4k00:07TOKYO, JAPAN - 12TH NOVEMBER 2017. Japanese couple walking in Yoyogi park in autumn.